The Scarlets sounded out a warning to their Heineken Cup rivals with an impressive 28-23 victory over Northampton Saints at Franklin's Gardens. The Saints, who suffered an agonising last-gasp defeat to Munster in their opening clash last weekend, would rightly question some of the refereeing decisions but the Scarlets capitalised on an error-strewn performance to move clear at the top of Pool 1 with a bonus-point victory. The Scarlets, who began their campaign with victory over Castres, had the game wrapped up by half-time with tries from Liam Williams, Aaron Shingler and Matt Gilbert. Rhys Priestland, the Wales fly-half making his first start since the World Cup, scored the bonus-point try as the Scarlets counter-attacked following a Chris Ashton knock-on. The Saints staged a late comeback to earn a losing bonus point with tries from George Pisi and Tom Wood, on top of 13 points from Ryan Lamb. The Saints suffered a setback before kick-off when Ben Foden was ruled out, having failed to recover from the rib injury he suffered at Thomand Park last week. Things did not get any better for Northampton as the Scarlets stormed into a third-minute lead with a try from fullback Williams. The Scarlets scrum spent most of the evening on the retreat but a strong set-piece effort set the platform for Gareth Davies to make the initial break. The scrum-half's off-load went to ground but Williams was able to kick the ball on before diving on it to give the Scarlets a perfect start. The Welsh region dominated the early stages but the power of the Northampton scrum relieved the pressure and earned Ryan Lamb a penalty, which he converted from under the posts. But the Scarlets hit back in controversial fashion immediately from the kick-off when referee Peter Fitzgibbon failed to spot a knock-on from Sean Lamont. The Scotland wing deflected the ball forward as he challenged Courtney Lawes for the restart and, as Northampton stopped playing, Shingler scooped up the loose ball, rounded Ashton down the wing and scored. Priestland's touchline conversion extended the Scarlets' lead to 14-3 and suddenly Saints coach Jim Mallinder, recently tipped as a replacement for England coach Martin Johnson, found himself in the spotlight for a very different reason. The Saints' Heineken Cup campaign was collapsing around them. Lamb steadied the ship with two more penalties, the second after Shingler's replacement Gilbert had pulled Lawes down at the lineout. But the Scarlets had the final say before the interval and it came from another Saints mistake, with Foden's replacement Pisi dropping Priestland's steepling kick. George North scooped up the loose ball, his Wales colleague Jonathan Davies took it on before Gilbert twisted his way over the line for the Scarlets' third try. 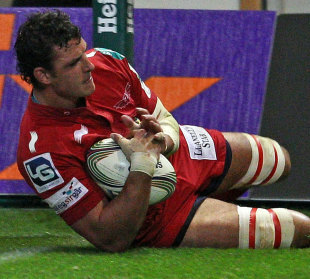 The Scarlets were reduced to 14 men when Jonathan Edwards was sin-binned for killing the ball at the ruck as Northampton pressed for a route back into the game. But when Lamb's penalty attempt hit the post, Ashton dropped a simple pass and once again the Scarlets profited, counter-attacking in ruthless fashion. Priestland got his boot to the loose ball 30 metres out from the Scarlets line and North showed a great turn of pace to hunt it down and hack on again. Priestland continued the chase, toed the ball forward for a third time and dived on it to send the boisterous travelling fans wild. The Scarlets made a raft of changes in the closing stages and their intensity dropped, which allowed Northampton to claim their second losing bonus point of the group. Pisi scored in the left corner before Wood galloped over for a breakaway try in the final minute.